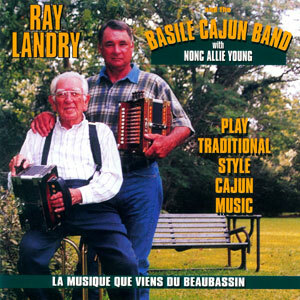 Ray Landry played accordion & handled vocals with the Basile Cajun Band for many years. In 1999, the band released their first CD on the Swallow record label, subtitled La musique que viens du Beaubassin, which was a reference to the place where the music ultimately comes from : the locale in Canada where the Acadian odyssey began in the mid-18th century. The album was nominated by the CFMA in 2000 as Best First Recording of the Year, and Ray Landry received a nomination asBest Male Vocalist of the Year. In 2008, Ray decided to strike out again, this time inviting friends & fellow musicians to perform with him, creating a CD that is bound to be a classic and a favorite in your collection for years to come. In the last few years I’ve reviewed a lot of albums filled with Louisiana music, including Cajun, Zydeco, Swamp Pop, R&B, Country-Rock, and probably a few I’ve forgotten. Some of those albums even included more than one variety of the area’s music. But a new issue From Ray Landry and Friends on the Swallow label is very clear about its contents. “Mes Racines Cadien Sont Creux” translates as “My Cajun Roots Are Deep.” The music is pure Cajun, and that means it’s warm and inviting, sweet and melodic — and impossible to resist. Landry is a veteran of the area’s Cajun music scene and he is sincere when he says, “Playing Cajun music, singing the songs and jamming with good friends could be described as my heaven on earth.” He enlisted many of those friends for the recording sessions that produced the tracks on this album. And names such as Mason Menard, Helene Boudreaux, Andre Michot, Dexter Ardoin, and Terry Huval, among others, reflect the Cajun heritage of the musicians. But let’s get into some specifics about the music itself. As with most collections, there are both traditional and newer pieces among the tracks, but the song titles here are all in French. Each does have an English translation available in the album notes, but the titles won’t mean much unless you’re a long-time aficionado of the music. Good stuff, as are all the pieces here — a real taste of authentic music from the bayou, courtesy of Ray Landry and Friends. Ray Landry (accordion, guitar and vocals) really loves his culture and heritage . . . but he REALLY loves his Cajun French Music, as this release proves. He has been a major supporter of the CFMA, especially with regard to the Le Cajun Music Awards. Here he chose to invite many friends he has played with over the years. Most prominent are Helene Boudreaux on vocals, Sheryl Cormier on accordion, Al Berard on fiddle, bass and mandolin, and fiddler players – Faren Serrett, Blake Miller & Mitchell Reed and — outstanding steel guitar players, Terry Huval and Jr. Martin. The Cajun musical tradition is filled with families who play music together. In recent times, the Balfa Brothers, the Savoy Family Band and Michael and David Doucet have maintained this tradition. In planning for his new CD, singer, guitarist and accordionist Ray Landry decided to include some of the friends he has played with over the years, friends that include several sets of parents and children playing music together. Included among the participants are Sheryl and Russell Cormier, Clarence and Joel Martin. and Harry and Lisa Trahan. The CD opens with the title track, written by Helen Boudreaux. The featured harmony vocalist on this song, she expresses her desire to keep the family name clean when you give it to the children. “La Valse de Soldat,” by Charles H. Broussard, follows. Harry Trahan’s accordion is featured on this sad tune about leaving family to go to war. Producer Al Berard is also featured throughout the CD on a variety of instruments, including bass, mandolin and electric guitar. He supplies steel guitar and fiddle on “La Valse de Soldat,” establishing an old-time sound. The CD concludes with “Jam de Grand Texas.” The arrangement shows the influence of Hank Williams’ Drifting Cowboys band on a tune that, of course, Hank Sr. borrowed for his own “Jambalaya.” Helen Boudreaux offers a new second verse that references the country classic. 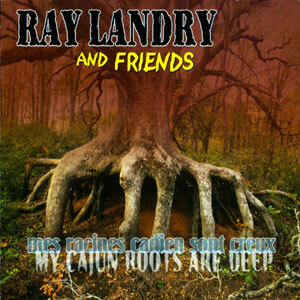 Mes Racines Cadien Sont Creux offers a great mixture of contemporary and classis Cajun music by Ray Landry, a musician who values family and tradition above all else. Ray Landry’s latest is not as dancehall-centric as his last disc, 1999’s Ray Landry and the Basile Cajun Band, which featured the last recording sessions of beloved accordionist Nonc Allie Young. Instead, the focus here is on songs and showcasing various musician pals, 19 of which sang or played a combined total of 25 instruments. Though Landry sings lead or harmony on all tracks and plays some accordion and guitar, this is more of a statement emphasizing the importance of playing music socially and recognizing the talents around him to form a cohesive whole. Helen Boudreaux wrote the disc’s most important track, the culturally sentimental title song that expresses Landry’s pride and devotion to his heritage. The woman dubbed “the Kitty Wells of Cajun Music” duets with Landry on six tracks and adds a verse to two songs (“La valse d’ennuie,” “La maison à deux portes”) to relay the often-overlooked female perspective. Amazingly, Boudreaux still retains her pristine soprano pipes after all these years. Landry was also gracious enough to share the accordion chair with Sheryl Cormier, who shines on “Big Texas Jam,” a super-sized adaptation of the Cajun staple “Grand Texas” and Hank Williams’ melody-borrowing “Jambalaya.” Though Landry can still bust out an exhilarating number like “la pouissièrre’s two step,” maintaining a sense of community and cultural devotion overrides all.